As you can see, this organization is in real trouble, because all of their Success Events are different across all of their report suites. The biggest issue with this is that you cannot aggregate data across the various report suites. For example, if you had one suite with “Internal Searches” in Success Event 1 and another suite with “Lead Forms Completed” in Success Event 1, combining the two in a master [global] report suite would make no sense, since you’d be combining apples and oranges. You can re-use implementation documentation and training materials. To read more about why you should have consistent report suites, click here, but needless to say, it is normally a best practice to have the same variable definitions across most or all of your report suites. Of course, the next logical question I get is always: “What about all of my historical data?” If you move data from variable slot 1 to slot 5, for example, Adobe Analytics cannot easily move all of your historical data. You won’t lose the old data, it just is not easy to transfer historical data to the new variable slot. Old data will be in the old variable slot and new data will be in the new variable slot. This can be annoying for about a year until you have new year over year data in the new variable slot. In general, even though this is annoying for a year, I still advocate making this type of change, since it is much better for the long term when it comes to your Adobe Analytics implementation. It is a matter of short-term pain, for long-term gain and in some way is a penitence for not implementing Adobe Analytics the correct way in the beginning. However, there are ways that you can mitigate the short-term pain associated with making variable slot changes. In the next section, I will share two different ways to mitigate this until you once again have year over year data. This first method of getting year over year data from two different variable slots is to use Adobe ReportBuilder. 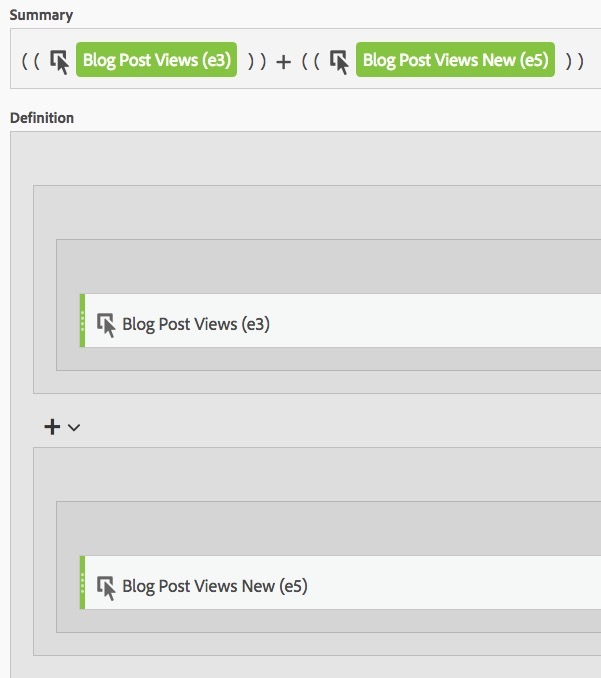 ReportBuilder is Adobe’s Microsoft Excel plug-in that allows you to import Adobe Analytics data into Excel data blocks. 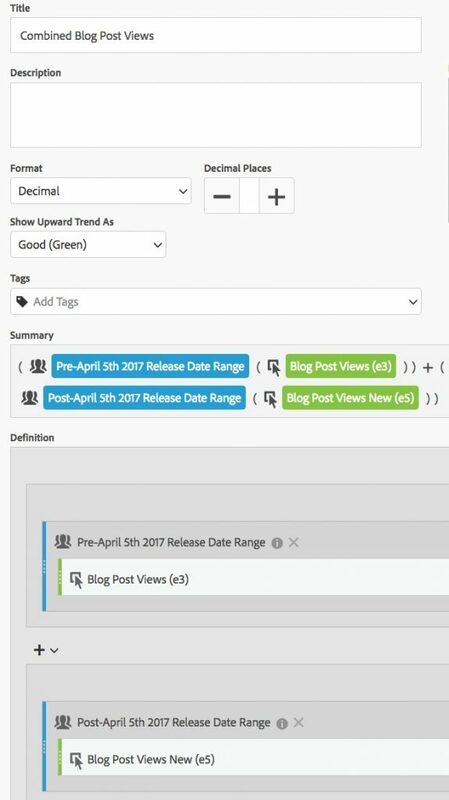 In this case, you can create two date-based data blocks in Excel and place them right next to each other. The first data block will be the metric (Success Event) or dimension (eVar/sProp) from the old variable slot and it will use the old dates in which data was found in that variable. 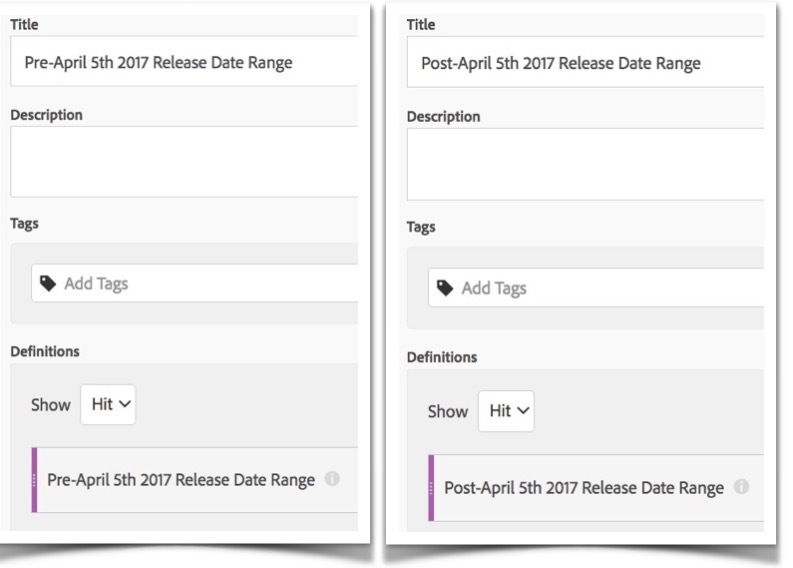 The second data block will be the new variable slot and will start with the date that data was moved to the new variable slot. For example, let’s imagine that you had a report suite that had “Internal Searches” in Success Event 2, but in order to conform to the new standard, you needed to move “Internal Searches” to Success Event 10 as of June 1st. In this case, you would build a data block in Excel that had all data from Success Event 2 prior to June 1st and then, next to it, another data block that had all data from Success Event 10 starting June 1st. Once you refresh both data blocks, you will have one combined table of data, both of which contain “Internal Searches” over time. Then you can build a graph to see the trend and even show year over year data. This Excel solution, still takes some work, since you’d have to repeat this for any variables that move locations, but it is one way to see historical data over time and mask for end-users the fact that a change has occurred. Once you have a year’s worth of “Internal Search” data in Success Event 10, you can likely abandon the Excel solution and go back to reporting on “Internal Searches” using the new variable slot (Success Event 10 in this case), which will now show year over year data. The downside of the preceding Excel approach is that seeing year over year data requires your end-users to [temporarily for one year] abandon the standard web-based Adobe Analytics interface in order to see trended data. This can be a real disadvantage since most users are already trained on how to use the normal Adobe Analytics interface, including Analysis Workspace. Therefore, the other approach to combining data when variables have to be moved is to use a derived calculated metric. 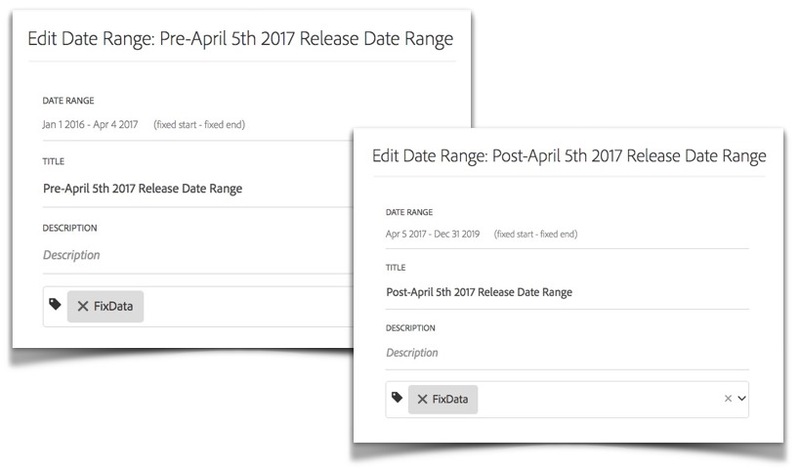 Now that you can apply segments, including dates, to calculated metrics in Adobe Analytics, you can create a combined metric that uses data from two different variables for two different date ranges. This allows you to join the old and new data into one metric that has a historical trend of the data and the same concept can apply to dimensions like eVars and sProps. This report is being run on April 8th, shortly after the April 5th conversion and you can see that the data is flowing seamlessly with the historical data. Of course, this still requires some end-user education, since looking at Success Event 3 or Success Event 5 in isolation can cause issues during the transition period. But in reality, most people only look at the last few weeks of data, so the new variable (Success Event 5 in this case) should be fine for most people after a few weeks and the combined metric is only necessary when you need to look at historical or year over year data. In extreme cases, you can hide the raw variable reports (Event 3 & Event 5) and use the Custom Report feature to replace them with this new combined calculated metric in the reporting menu structure (though that won’t help you in Analysis Workspace). To summarize, if your organization isn’t consistent in the way it implements, you may lose out on many of the advantages inherent to Adobe Analytics. If you decide that you want to clean house and make your implementations more consistent, you may have to shift data from one variable to another. Doing this can cause some short-term reporting issues, since it is difficult to see historical data spanning across two different variables. 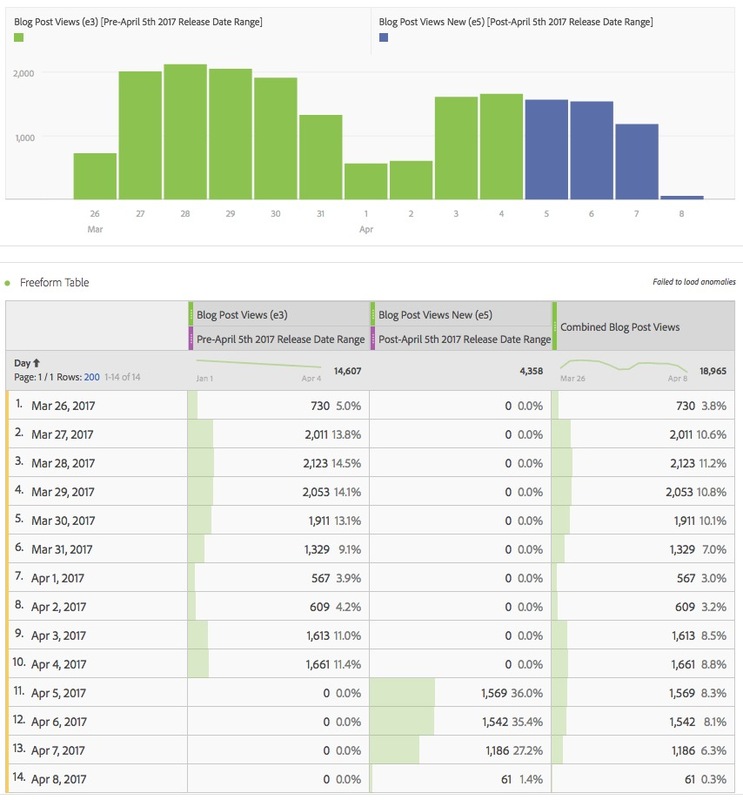 However, this can be mitigated by using Adobe Report Builder or a derived calculated metric as shown in this post. Both of these are not perfect, but they can help get your organization over the hump until you have enough historical data that you can disregard the old data prior to your variable conversion.